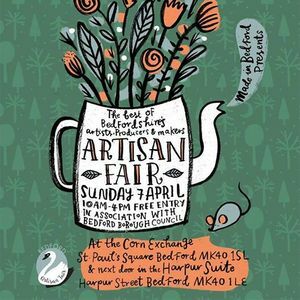 The Artisan Fair is Bedford's largest local arts, crafts and produce fair. 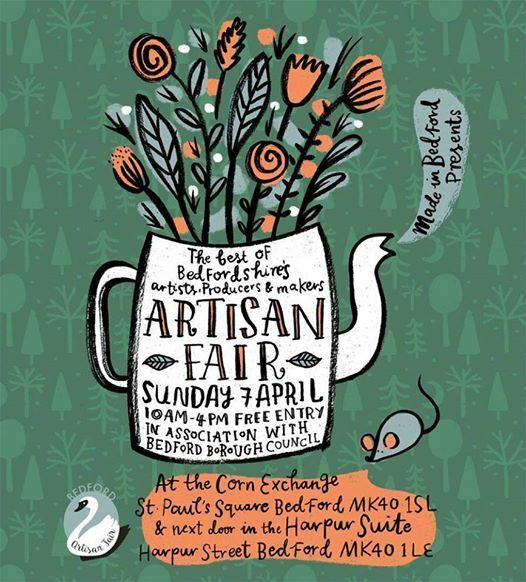 The Spring Fair will take place over 3 connected venues, the Corn Exchange, Harpur Suite and Howard Room right in the centre of Bedford on Sunday 7th April from 10am - 4pm. Parking is free in all Council car parks on Sundays! The best local artists, craftspeople and producers will be showcasing their work so this is an ideal opportunity to buy unique cards, gifts, homewares, handmade chocolates and other treats for Easter. After shopping visitors will be able to relax with a cup of locally ground coffee and homemade cake or try a range of locally made food including vegan street food. Plenty of activities too, there'll be a large new craft workshop area, all details to follow. Plus live music from Acoustic Amy, May Blossom - Vintage Songbird and James Burke. So much to see and enjoy and the great thing is, everything is produced by local people! 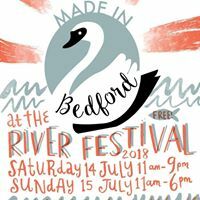 Bedford has a lot to be proud of so come and join us for a great day out for all the family. Admission is free!